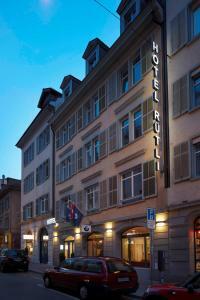 The completely renovated Sorell Hotel Rütli is located in the heart of Zurich's old town, next to the funiculars and the ETH Zurich university. All rooms are air-conditioned and feature a flat-screen TV. Via the TVs in every room you can also surf the web, watch the newest films and listen to the radio. A wide selection of drinks can be enjoyed in the Sorell Hotel Rütli's stylish bar. Lots of restaurants can be found in the surroundings of this B&B hotel. The Sorell Hotel Rütli has excellent public transport connections and there are also 2 multi-storey car parks nearby. Several tram lines go directly to the main railway station. Many of the city's sights and attractions are within walking distance, including Lake Zurich and its promenade, the opera house, theatres and museums.